Explore Life Lah! : DNA of Explorer Life Lah! DNA of Explorer Life Lah! Having browsed through the blogs of my fellow travellers in the category, I can really feel their passion and dedication in capturing and sharing their trip encounters. That's also what Explore Life Lah! hopes to be... a conversation about the places, people and cultures I have the privilege of exploring. 'Cuisines' encompasses all my overseas diet that ranges from fine wine and dine to hawker food to street delicacies to downright gastronomical mayhems such as eating bugs, spiders and duck hatchlings (post coming soon). 'Bizarre' covers all the musings about unusual discoveries and encounters while on the road. It can be about an 'attack' of the ladyboys, coming face-to-face with death or foreign customs that made me look a second time. The photos were also selected for the meaning they hold. Under 'Stories . Tips . Photos & Videos' there's a photo of a flame from an oil lamp. What has that got to do with the genome of this scope of topics? Well, by sharing stories, tips, reviews and pictorials, I hope that this blog can provide illumination for for your research and trip preparations. Likewise, the photo of a jaw bone by the beach symbolises getting to the core of an experience so that you have an idea what to expect and be forewarned of possible threats. When we see a skull sign, it always represents danger right? Heh. There's still a lot I want to explain about the make-up of this blog and how I really wish it to be useful for holiday-makers or just for a fun read, but I guess nothing beats exploring the conversations here yourself! I hope you'll find Explore Life Lah! to be worth your time. If the DNA of this blog strikes a chord with you, I would be mighty glad if you could vote for it in this year's Singapore Blog Awards. 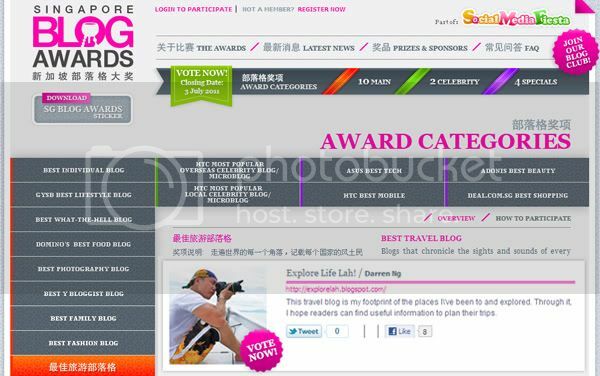 Or if you find a DNA match with any of my fellow travel bloggers, please vote for them. As each blogger's perspective is different, I don't see them as 'competitors' but rather, as members of a globetrotting family! Step 2 : Click on 'VOTE NOW!'. A pop-up window will prompt you to 'Login'. If this is your first time voting, click on 'Register Now'. Step 3 : You'll be directed to a Registration page. Fill in your particulars and submit. A confirmation email will be sent to you. Check your email and follow the link in it to complete your registration process. Step 4 : 'Login' with your Username and Password to vote. You can vote once every 24 hours. The more you vote, the higher your chances of winning the voters' lucky draw and also help make us the bloggers very happy!